Gene DiDonata and Brad Pattie of Washington Department of Fisheries, getting ready to fly over the Soviet fleet fishing off Astoria, 1967, Photo by Bob Hitz. Airplanes have always fascinated me. When I was a youngster during World War II I collected airplane cards found in the Wing cigarette packages, built models, drew airplanes in my school notebook and collected scale drawings of them as they became available. WWII pilots were my heroes and I suppose like all males of my age I wanted to be a pilot. So you can imagine my excitement in 1967 to be invited to fly over the Russian fleet with the Washington State Department of Fisheries. The fleet had appeared the year before en mass off the Oregon and Washington coasts causing great concern, and a diplomatic move was made that year to extend the 3 mile territorial limit to 12 miles, a major and rapid change that went into effect the first part of 1967. It’s been 55 years since I stepped up into the plane at Boeing Field in Seattle. 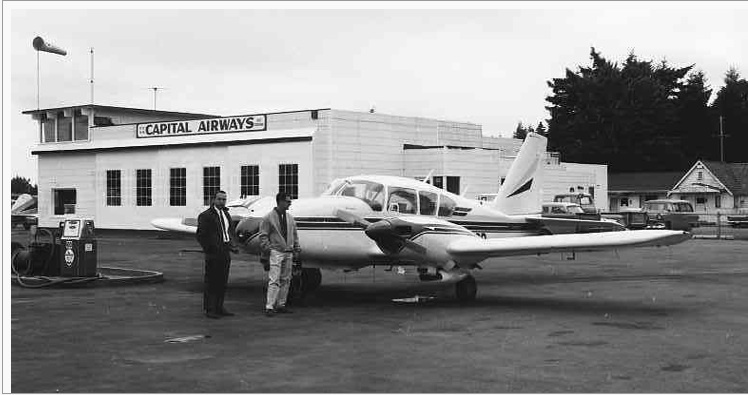 I remember it well, a twin engine Piper Aztec that seated 5 people. I sat on the lefthand side behind the pilot, who along with the co-pilot was a state patrol officer. Two others boarded, Brad Pattie and Gene DiDonata, both working for state fisheries. Brad was the observer who sat in the aft part of the cabin on the bench seat where he could easily view out either side of the aircraft. Attached is a photo I took of the plane before we departed, which shows Gene, the head of Washington’s ground fish program, standing on the left and Brad on the right. The Krutoy, type SRT, hull # T4393 and fleet # PP810. We taxied out to the end of the runway where the pilot and co-pilot went through their preflight routine, running up the engines to check them and seeing that our seatbelts were fastened and that we had on our life vests, the so-called May West. Then we were off, with the engines at full throttle gaining speed down the runway and finally airborne, the wheels coming up and we were heading west toward the ocean. Soviet factory processing ship with a cod end of fish. many years of not seeing each other. He had only missed one of the estimated eleven flights made over the Russian fleet. He said that the Washington State commercial trawl fleet wanted to know what the Russians were doing along our coasts, how many ships there were and what they were catching. 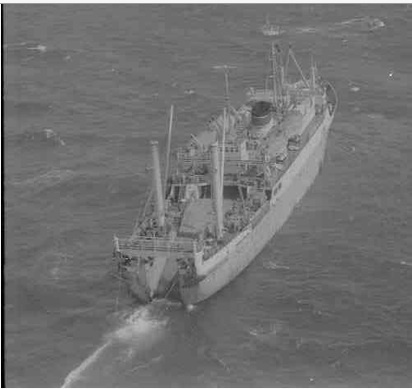 The state decided to find out by flying over the fleet and recording each individual ship by name, hull number and fleet number which were visible on each ship. The names were in Russian, so the key was the Russian alphabet. Brad took pictures of each and recorded them by name as they flew by. The pilots would record their position by reading the intersecting loran lines from the radio in the cockpit, converting the readings to longitude and latitude. 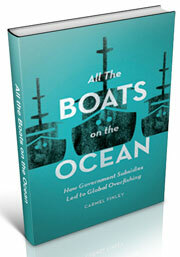 At the end of each trip Brad wrote a report giving the location of each vessel in the fleet. 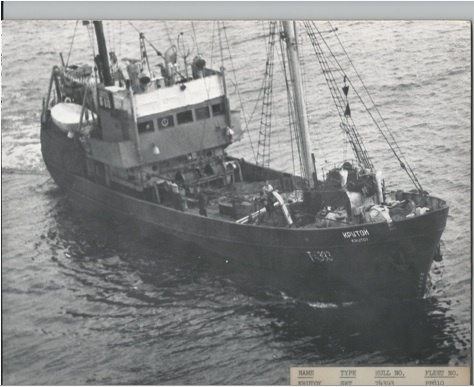 Each photo was filed with the following information on the print, as the accompanying figure which Brad supplied shows: Vessel name Krutoy, type SRT, hull # T4393 and fleet # PP810. Their flights would start in Seattle, flying over or alongside the Olympic Mountains coming out near Grays Harbor, Washington. On one of the flights Brad remembered it was foggy and they kept gaining altitude in the fog. Only the hum of the engines and the pilots in the front seats were audible or visible. When they broke out on top of the fog you could see “forever” – it was beautiful on top of the world. Once they reached the ocean they would level out at about 1,000 to 2,000 feet and head out in a diagonal direction from the coast, looking for ships on the way until they reached 20 miles out where they would change course, heading back in toward land. Whenever a Russian ship was sighted they would descend rapidly to just above the ocean surface, where they would fly alongside it. Brad would note the name in his notebook while the pilots took readings to determine its position. If it was a new or unknown ship, they would return and take a picture, making sure they got the name and numbers off the hull and house. It took about two hours to cover the coast of Washington out to 20 miles and once covered they would land at a coastal airfield and take a break. Then they would fly back out 40 miles and cover the area between 20 and 40 miles along the entire coast, which included the 100 fathom contour where the continental shelf becomes the slope. As they flew over the vessels they would check on the catch if there was one. The red fish that were seen in the net or on the ship were probably POP or Pacific ocean perch. 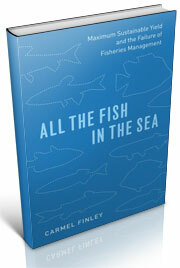 Those were generally found along the 100 fathom contour and deeper, while in shallower water the catch was mainly hake. 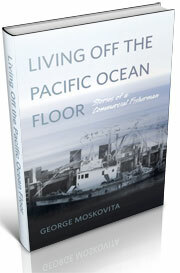 I was on that flight due to my work on the “Catalog of the Soviet Fleet”. (1) It was an unclassified document and since we were in a “cold war” with Russia, the Coast Guard and Navy had the only classified identification keys to the Soviet fleet, which we and the public could not use. My key could be used. Brad would check his photos with my catalog to determine the type and class of the vessel and its use. When we spotted a vessel we would drop rapidly, losing altitude until we were just above the water’s surface. The plane cruised at about 180 knots and as we neared the vessel our pilot lowered the flaps, slowing down to about 110 knots, and as we passed Brad read the numbers and name and recorded them in his notes. It was exciting, a lifetime event and one I will never forget. We did it time after time and least 30 vessels were counted during the trip that day. The pilots were extremely skilled at what they were doing. Brad said that on one of their flights they went alongside a large support vessel and they were so low that as they passed he looked up at the bridge. After the morning flight covering the coastal area out to 20 miles we took a break at Copalis Air Field in Grays Harbor. It was a relief to get out of the plane and walk around. When we took off again we flew out to 40 miles off the coast and finished off the coastal area between 20 and 40 miles, flying over a number of Russian vessels fishing the continental break at around the 100 fathom contour. We saw several of the large stern trawlers hauling their cod ends up the ramps with red fish in them, apparently POP. Every time we banked and let down to pass a ship it was a thrill, but apparently it irritated one of the Russian seaman, because Brad told me of an individual who ran out on the bridge and covered up the number. When they flew by again the same thing happened, so the pilot quickly banked around the bow and back along the opposite side, recording the number before it could be covered. On our return we flew over Astoria, Oregon where we looked down to see the new bridge and the place where the Cobb would tie up at the port docks when we worked off the Columbia River. Then we flew low along the coastline above the surf line, finally gaining attitude and heading for Boeing Field, completing a wonderful day- a once in a lifetime experience. (1) Hitz, Charles R., Catalogue of the Soviet Fishing Fleet. National Fisherman Yearbook Issue 1968, Vol. 48, No. 13, March 31, 1968 pp 9-19, 21-24. 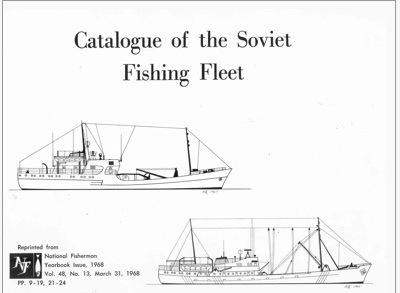 This entry was posted in Cold War, Environmental History, Exploratory Fishing Base, Fisheries policy, fisheries science, Fishing, History of Science, History of Technology, Maritime History, Ocean fishing, Pacific Fishing History Project, Sebastes rockfish, Soviet environmental history, Soviet fishing, Soviet history' and tagged Sebastes rockfish, Soviet fishing. Bookmark the permalink.